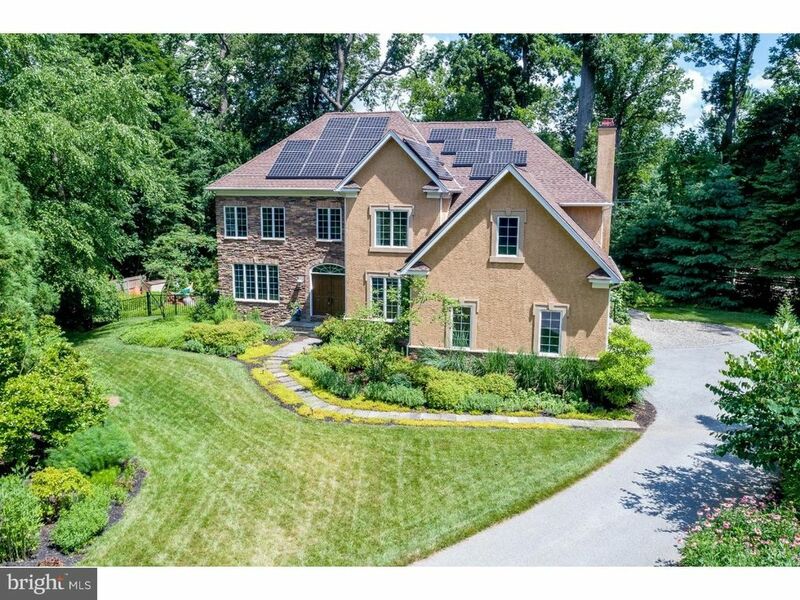 Nestled down a long driveway on a secluded, yet convenient, .82 acre lot in Bryn Mawr is this bright and airy 4-5 BD, 3/2 BA home. Custom-built only 14 yrs ago, this property has been beautifully maintained & extensively upgraded with meticulous attention to detail. Interior finishes incl. wood floors, enhanced millwork, custom closets, and much more. The soaring 2-story Entrance Hall leads to an open Kitchen/Breakfast Room/Family Room, providing great flow for entertaining. The Kitchen has 42 cabinets, granite counters, and stainless gourmet appliances, incl. a Thermador 5-burner gas cooktop with pot filler, double ovens, & a SubZero refrigerator. A Sitting Room, Dining Room, Study, and large Laundry Room complete the 1st floor. Low-maintenance composite rear deck features built-in cabinetry, plumbed-in natural gas grill, and an extra-large Big Green Egg BBQ surrounded by extensive counter space. Stone steps lead to the heated pool and the professionally landscaped yard which is bordered by mature foliage for privacy. Downstairs is stunning walk-out finished lower level with Media/game table areas and a Bonus Room (possible Bedroom). A gorgeous Bathroom has designer tile, spa-like sink, & large steam shower. Entertaining, both inside and out, is easy with the lower level Kitchenette, featuring custom cabinets, glass subway tile backsplash, sink, dishwasher, microwave, and refrigerator. Custom barn-style sliding doors attractively conceal the partially finished Exercise area, and unfinished storage & mechanical rooms. Upstairs, via front or rear stairs, is the huge Master BD suite with cove ceiling, two large walk-in closets (one with a dressing area and beautiful custom organizers), and a large Master BA with soaking tub. 2 more BD share a Hall BA, and 4th BD has en suite access to ~ BA (which is plumbed for a shower.) Large 2nd fl. Storage Room with window could be finished for additional living space. You'll love parking in the professionally finished 2-car Garage with all-weather flooring and custom organizers. Systems include dual-zoned HVAC, 2 hot water heaters, solar panels (which lower utility costs), gutter shields, sprinklers, phantom screens, automatic pool cover, and fenced rear yard. Highly-ranked Lower Merion schools. Near shops, restaurants, and movies in downtown Bryn Mawr and just a short stroll from Ashbridge Park, Stoneleigh Garden, universities, and train stations. EZ access to Center City, Airport, and corporate centers.